With the advent of Web 2.0 and with the development of interactive tools that allowed users to express opinions and suggestions on different topics, the way to do business, socialize with other people and also the academic environment, both in terms of teaching and research, is changing. In companies, thanks to interactive tools of Web 2.0, managers are in a close contact with end customers to improve the product/service. In the academic world, this technology can be used exploiting e-learning platforms enriched with interactive virtual channels thus promoting the methodology of learning by doing and the constructivist theory of collective participation of students in the knowledge construction. In this context it is also possible to develop a collaborative research between academics and scientists. The number of websites of the science 2.0, with scientific cooperations and the creation and distribution of quality papers in journals, is growing. Also, the ability to manage complex scientific projects and seek funding sources is increasing. 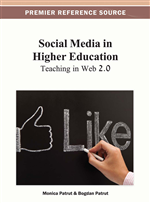 In this chapter, the author analyzes different models of e-learning and designs a University 2.0 framework that supports, by advanced Web 2.0 tools, teaching and research in the university. In recent years, web 2.0 tools (chat, blog, forum, wiki and social network) (O’Reilly, 2005, 2007) are developing. By these tools, enterprises interact with all stakeholders (customers, suppliers, sponsors, partners), listening opinions and suggestions to improve the product/service. For an enterprise, customer’s opinions are very important both for the improvement of products and also for the reinforcement of the customer loyalty. The customer will be motivated to be loyal if the enterprise shows a strong attention to his/her needs and identity. A new way of doing business (McAfee, 2006), a participative business where the companies and customers work together (co-operate, co-create, co-produce,...) (Tapscott and Williams, 2006) to improve the final product/service, is affirming. Therefore we can say that the web 2.0 is invading all areas of our life: work, business, school, university, leisure and holidays. In the web 2.0, which supports a network of people, we can take in consideration two aspects: technological and social. The technological aspect concerns the hardware and software architecture (computer, network, applications) while the social aspect is relative to people that interact and exchange information. The technology surely is the trigger but the people are the real core of this evolution. Every day, people exchange and share experiences, opinions, photos and video. The key features of the web 2.0 are: sharing, cooperation, collaboration and interactivity. A collaboration between companies, people, students, teacher and so on, in a context of co-creation and co-production, encourages the realization of the figure of the prosumer (producer and consumer at the same time) (Toffler, 1980). The consumer is becoming a co-creator of value (Witel et al., 2011) while in the past he/she was a passive responder to the market supply. The Web 2.0 also leads to a revolution in the content generation. Until few years ago, users read only, in a passive manner, information from websites but now they have the opportunity to actively insert information, graphics and multimedia objects. The user can create contents, movies, express opinions and give advices using different web 2.0 tools: digital video, blogs, podcasts, wikis, Flickr, YouTube, Facebook, Wikipedia. He/she becomes User-Generated Content (Strobbe et al., 2010) or Consumer Generated Content (Sumi, 2008). In the web, the contents’ production is no longer the prerogative of media centers, press and traditional producers but everyone, by web 2.0 tools, can participate in the discussion and produce interesting contents.